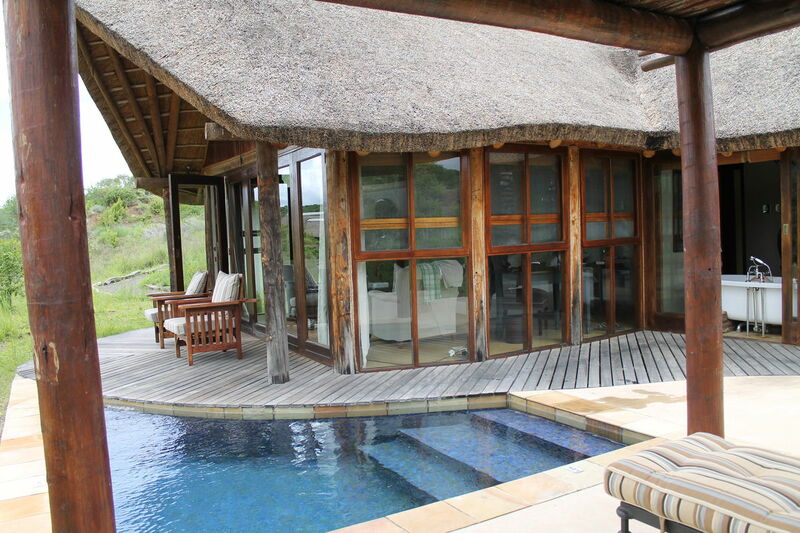 Four nights of luxury at Kwandwe Private Game Reserve, South Africa? 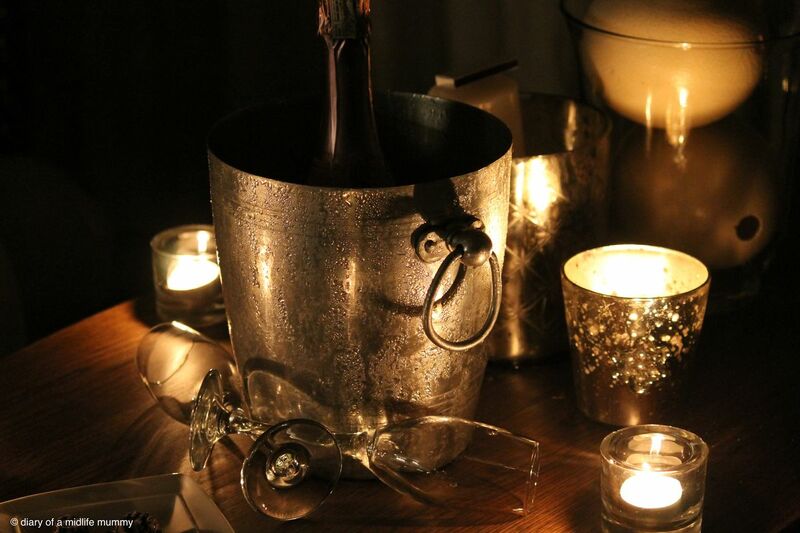 ……..
….. don’t mind if we do!!! To say I was looking forward to our safari was an understatement! So when we finally had confirmation that our little trip for two was booked, I was over the moon! As we were staying in Stellenbosch, we didn’t want to travel too far away from our children, and had also decided in this instance not to travel to a malaria area (I always giggle a little when I say those two words together! ), so options were a little more limited I suppose but were still hugely provided for. Once we’d said goodbye to our girls and their grandparents in Stellenbosch, we caught an internal flight from Cape Town, over to Port Elizabeth in the Eastern Cape, (which was only about 750kms away, whereas Kruger National Park would have been about 1780kms away). 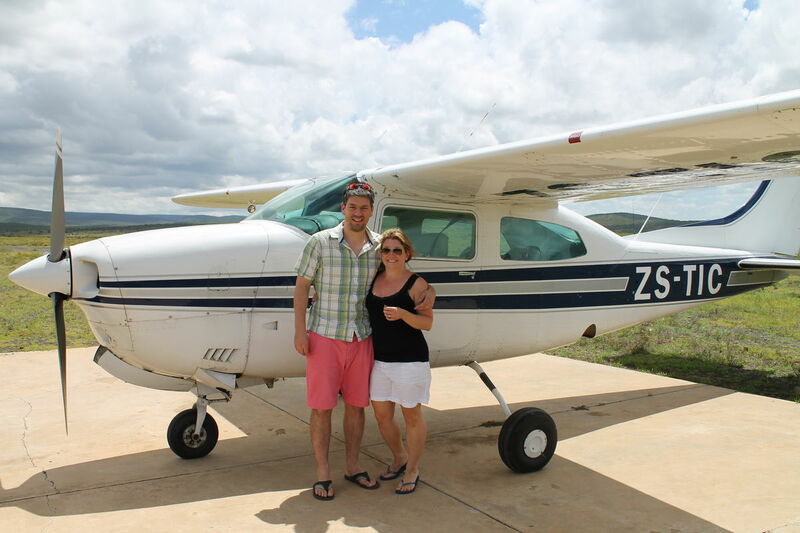 Once we’d landed in PE, as an extra special treat, we’d splashed out and treated ourselves to the small plane transfer to take us from the main airport to our game reserve. Although on meeting the pilot – who I didn’t believe at first was actually a pilot as he looked about 12 years old! – we were given the unfortunate news that we’d have to drive most of the way instead due to bad weather conditions. We smiled and said not to worry in typically British fashion – but were rather disappointed. After miles on the road, we arrived at a tiny airstrip and saw what looked like a toy plane! That’s it?! That what we’ll be flying in?? Umm – not really what you need to hear before your first ever flight in a toy plane but oh well. Nothing could suppress our eagerness – not even if the plane was slightly falling apart and perhaps not working properly. So, with the all clear and headgear firmly in place, it was time to go. The flight literally took only about ten minutes to get to our base (grumpy face! ), but still we loved every minute of it. Mr B even got to fly the plane!! I was hinting about this to the pilot on the drive over and had a sneaky suspicion he’d let me fly, so when he asked if I’d be sitting up front, I said no to let Mr B have his Top Gun/Maverick moment!! Something he’s dreamed of for many years! 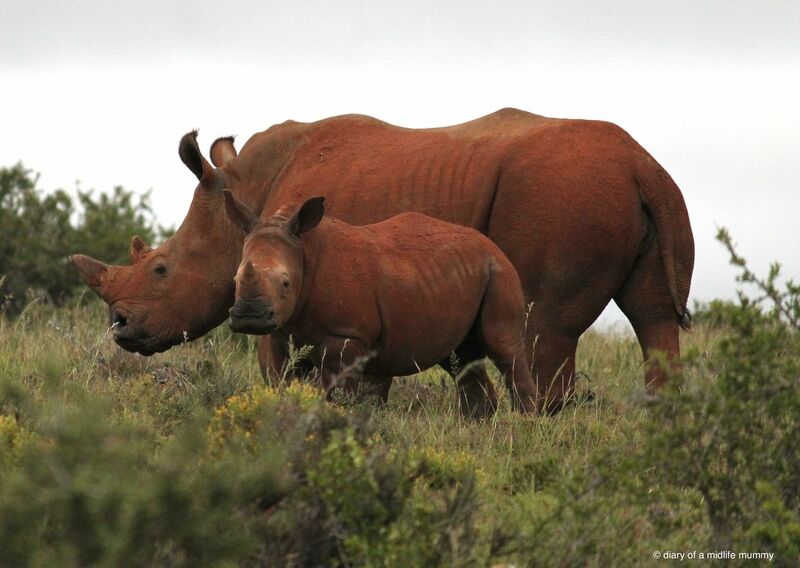 The pilot radioed ahead to the reserve to make sure the landing strip was free from animals (! ), and down we went. Once we’d disembarked (fallen out of) the plane, we were shown over to a jeep which was waiting to take us to the main reception to check in. There we were met by a charming, rather curvaceous lady, full of welcoming gestures, hugs and smiles, and laden with freshly baked biscuits and refreshing homemade lemonade. Just what the doctor ordered after our journey! Once all checked in we hopped back into the jeep and set off into the wilderness to find our lodges. 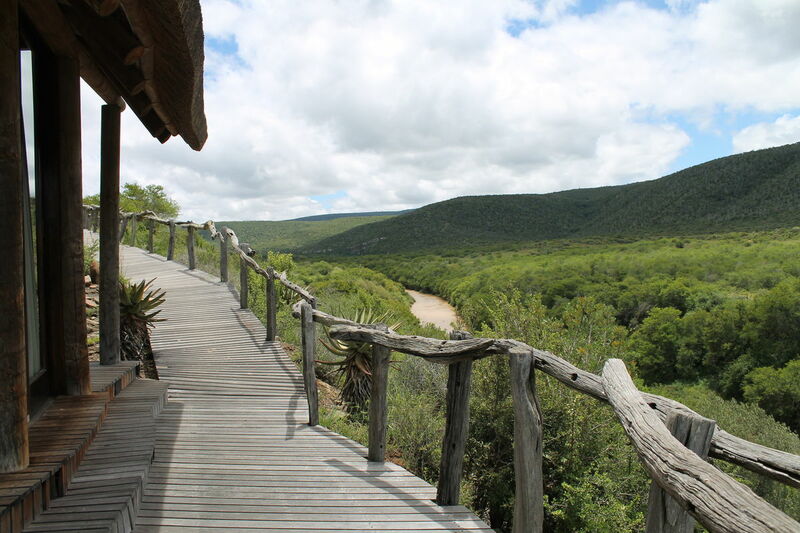 Of the four different lodge types to opt for, we chose the Great Fish River Lodges, which were a series of only 8 little thatched huts nestled in amongst the grassy hillside overlooking the Great Fish River and the lush greenery of the reserve beyond. Even the transfer was fantastic. And how often do you hear yourself saying that! Mr B and I were suddenly silent, heads twitching and eyes darting in all different directions in the hope of catching a first glimpse of any animals. 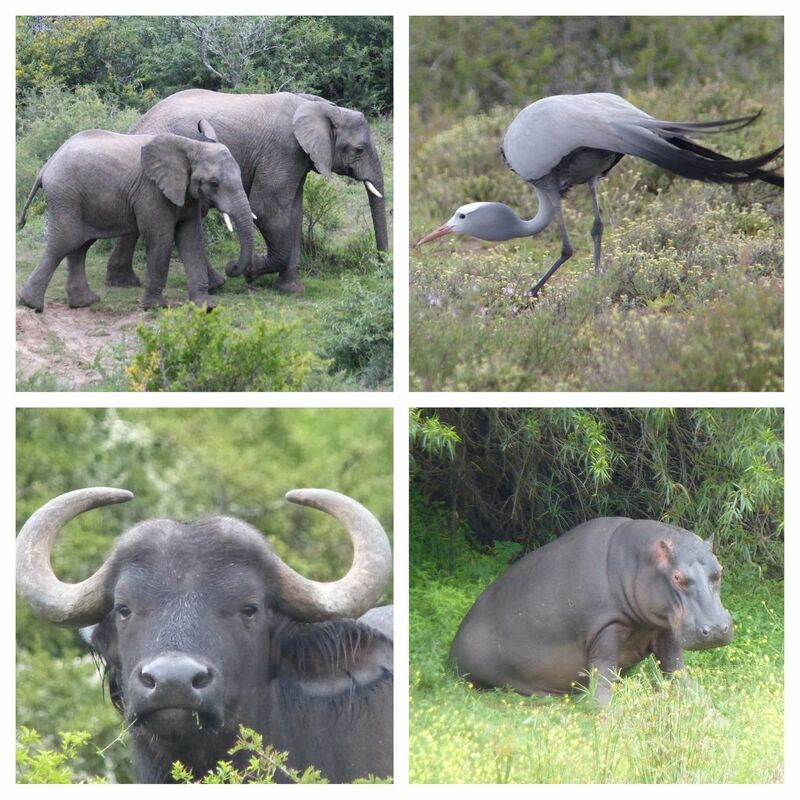 We were lucky – as en route we came face to face with giraffe, warthogs, spotted an elephant in the distance and saw an array of birds and flowers. Not bad for a transfer eh! On arrival at the main lodge, we were welcomed with a lineup of brightly clothed staff, all singing traditional South African songs, and again full of wide, warm smiles. 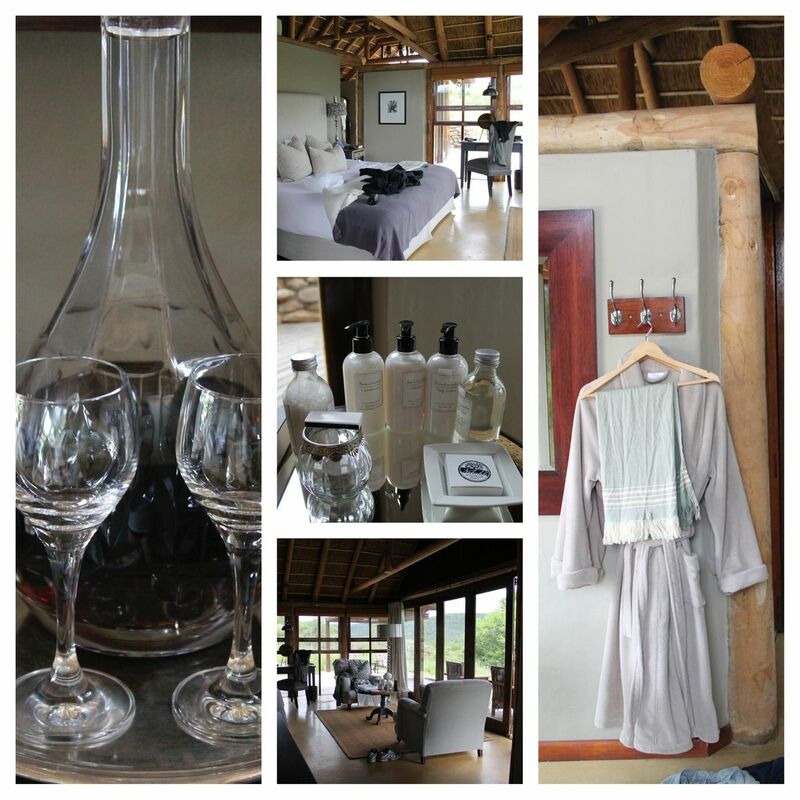 They handed us drinks and hot flannels to refresh us and showed us inside into the luxury of the main lodge. 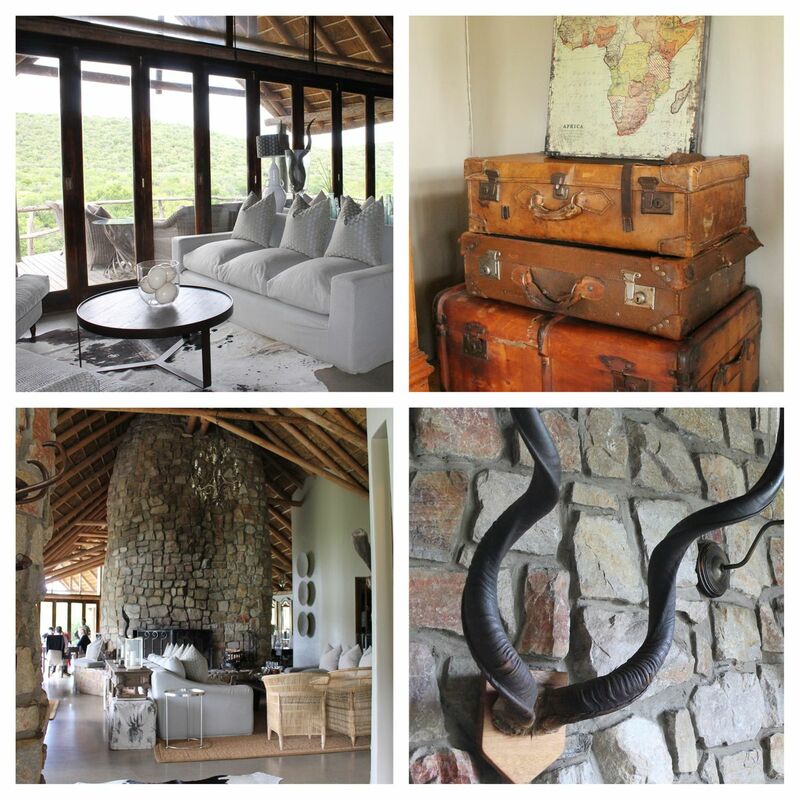 Inside, the furnishing was of a decadent game lodge; with log fires, stone walls awash with antlers, sumptuous sofas and armchairs with plumped oversized cushions, a free bar and whisky trays, a library and games room and huge glass windows which looked out over the river across to the North side of Kwandwe. By the time we arrived it was lunchtime, so we were shown immediately to a table overlooking the river. The food was superb!! I’m typing this now and salivating at the memory of the artichoke salad we had on that first day!! I’d always thought I’d dislike artichokes so have always steered clear but I couldn’t have been more wrong! After lunch we were shown along the little pathway to our very own private lodge. The door opened and again we were met with pure luxury, in a hut in the middle of nowhere!! It was rather bizarre but fabulous nonetheless! And we sure weren’t going to complain about it!! A huge bed in the center of the room with two comfortable armchairs overlooking the wall of glass that was the bi-folding doors leading out onto the verandah. Here there were more chairs, two sun loungers and our very own plunge pool. It was a little chilly when I dipped my toe in, and if I’m honest – I was a little scared too, as there could have been a crocodile at the bottom!! Ok – so maybe not, but that’s what my imagination was telling me!! 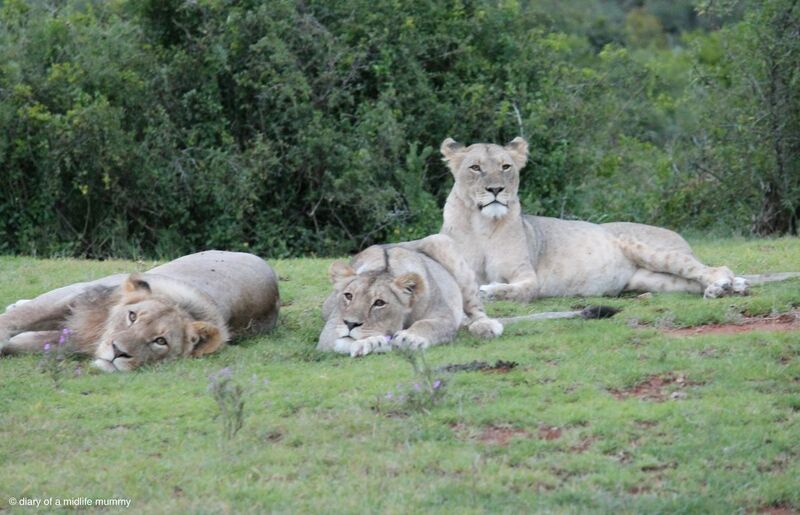 And, while we’re on the subject, if I was extra honest, I was a little scared to lie out on the verandah as there was a large bush next to the hut, which looked like the most perfect hiding place for a pride of lions just to pounce out on us from!! Not so much just my imagination this time though, as we’d just been informed that a staff member only last week had spotted a couple of lions sitting just up on the hillside, directly up from our hut!! This is why the staff stress that guests are not to walk by themselves during the darker hours, so instead are escorted by little ladies armed with nothing other than a torch!! Now how on earth would this help in that sort of emergency!!?? I didn’t know, but was equally sure I didn’t want to find out either! You could hardly see the other lodges. Just glimpses of their thatched rooftops. It was wonderfully private but slightly unnerving at the same time!! Especially when sometimes from across the other side of the river all you could hear was the eerie sound of a single distinct birdcall. I never did get to find out what bird it was though – so I will just have to go back and ask! The sound of wild South Africa was exhilarating. So many bird calls and animal noises in amongst the total silence. Quite haunting and still. 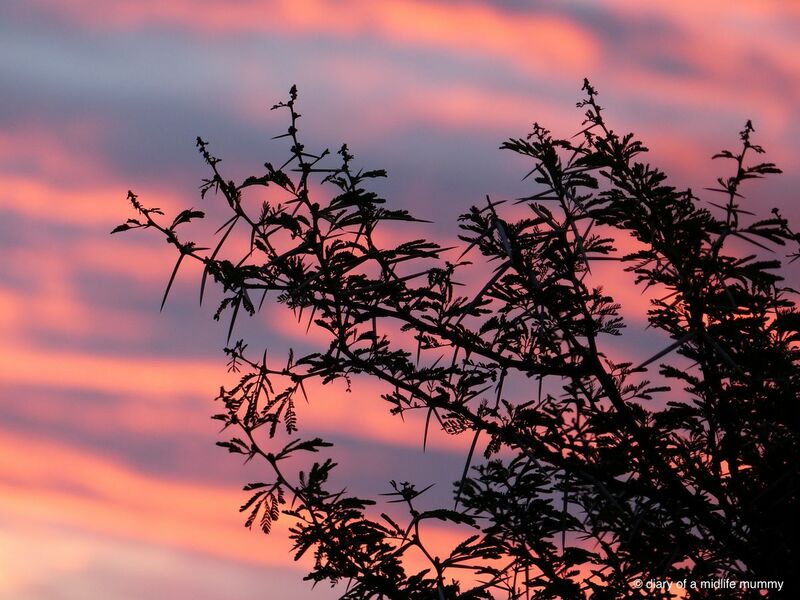 We set our alarms to wake early the next morning ready to meet our allotted rangers and prepare for the game drive – I think we were up about 5am! So much for a lie in ‘sans kids’ !!!!! The early morning drives started around 5.30 and the afternoon/evening drives from 4.30pm, and each lasted around three hours. Words will now not even get close to describing how utterly magnificent these drives were. Each and every one of them. Unfortunately for the days we were there, the weather was pretty appalling. Driving wind and rain on over half of the drives which was a shame, but whilst others in our group of six sometimes decided to have a lie in or stay in the warmth of the main lodge, Mr B and I were proud to say we went for every single one. And there was only one occasion where the drive was cut short due to the worsening conditions – especially as the animals were in hiding too, under any cover they could find as they endeavored to stay dry. So, wrapped up warmly in our layers of clothing, rainproof jacket, blanket and poncho(!) we bumped excitedly along the tracks in search of the animals! 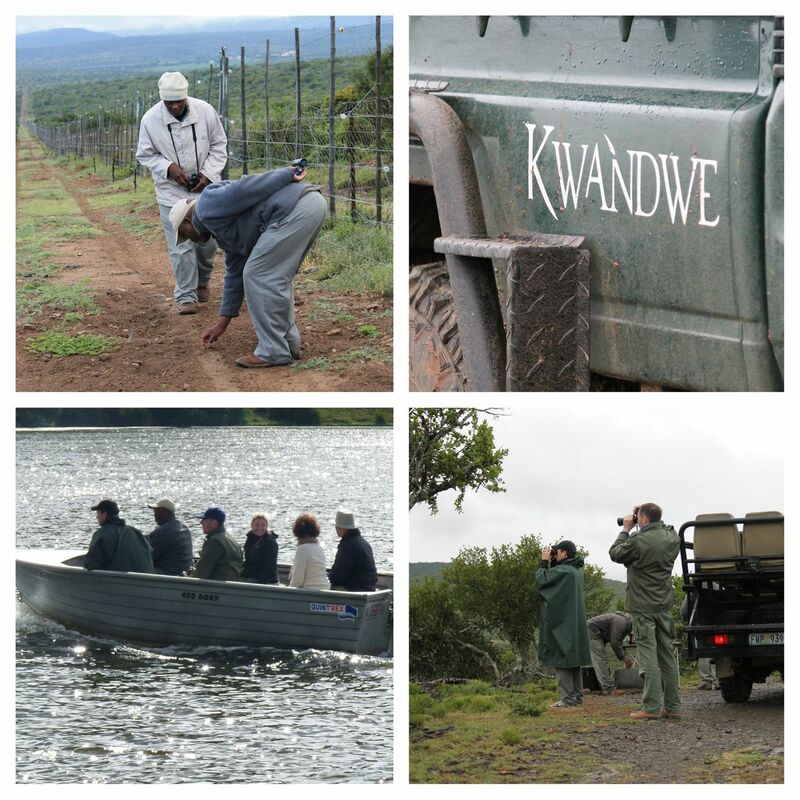 Kwandwe was not what I imagined an African safari to look like. I’d envisaged endless open landscapes of tall grasses and plains, with the odd trees and bush scrub here and there, and animals as far as the eye could see. Instead, Kwandwe was more of a conservation area, with less animals in amongst very dense areas of scrub, thicket and forest. 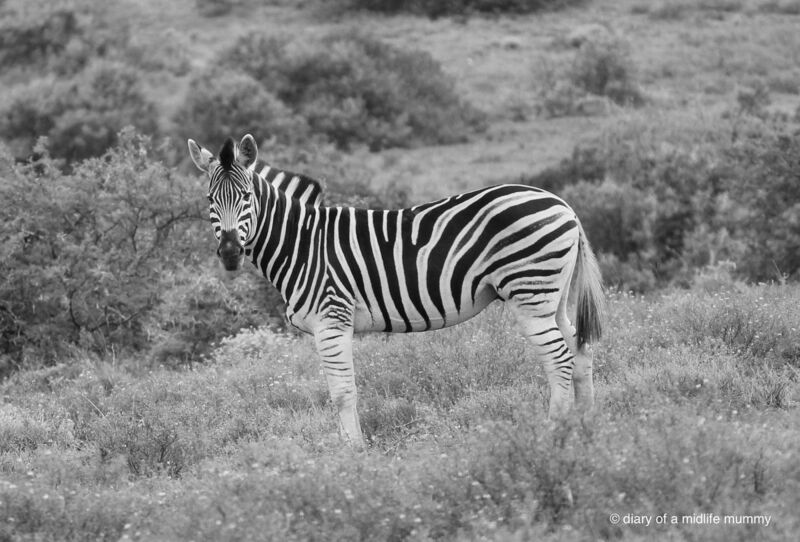 Therefore as you can imagine – it was much harder to actually spot the wildlife. 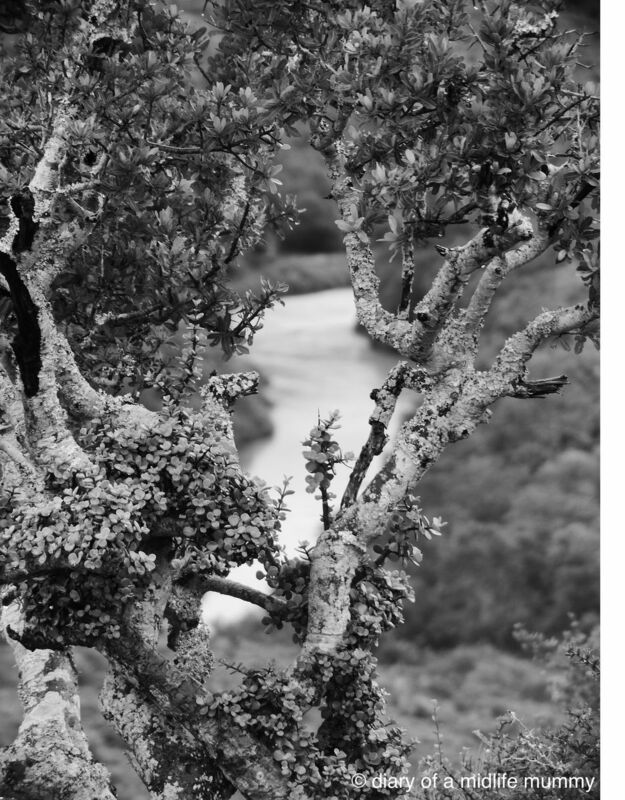 Don’t get me wrong – there were still lots of wildlife, but they were often hidden! In a way though – I feel this made it more thrilling. It was a real buzz to just happen upon an elephant or turn a corner and surprise a herd of antelope. The delight was in the adventure of the search just as much as it was in actually seeing the wildlife. Now, here is where I could ramble on for hours in telling you what we saw, but I won’t bore you to tears! Instead I will say that we spotted pretty much everything you would expect to see, with the exceptions being the large male lions and the leopard. 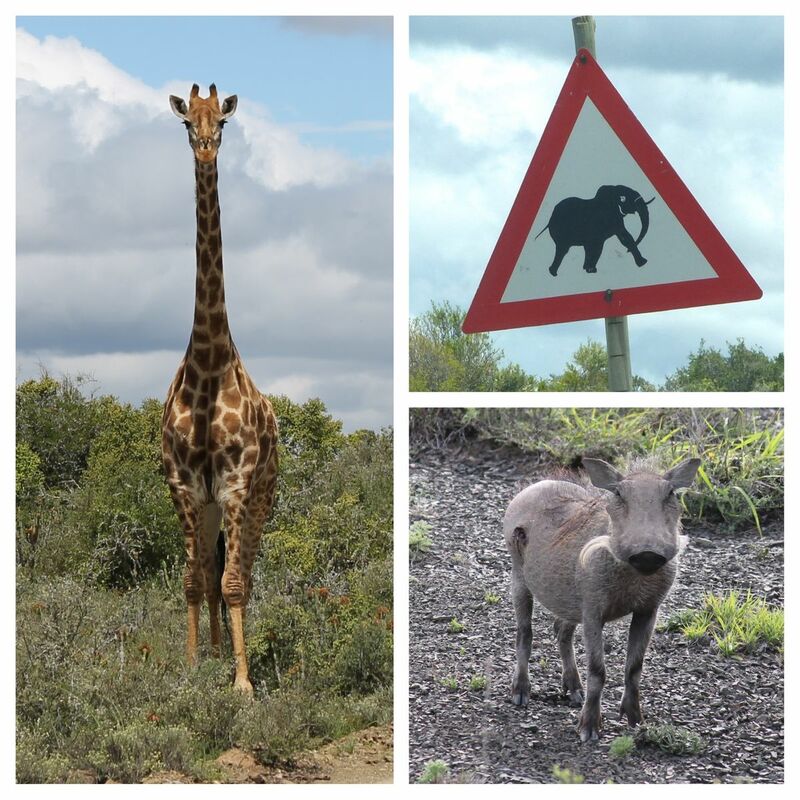 Our drive highlights though were…..
On our first game drive we really couldn’t believe our luck. 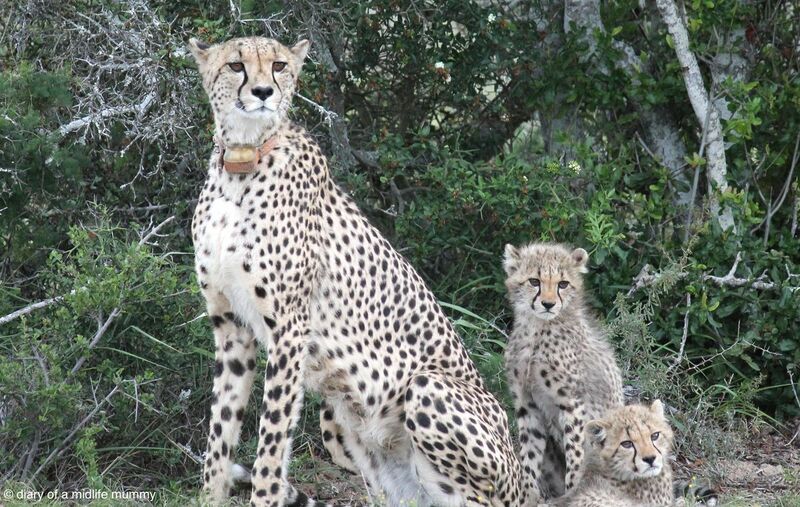 The very first animal we found was a magnificent mother cheetah and her two absolutely adorable cubs! And we were so close to them – only about ten meters or so away! We stayed for ages just watching them huddled together, groom one another, stretch and then followed at a nice distance behind as they walked off. It was as if the mother had all of a sudden spotted something or caught wind of something – food perhaps – so off she set with the boisterous cubs bounding playfully behind her. We saw them again later in the week, but from much, much further away, so realized how utterly incredible and lucky our first sighting had been. We sat and observed a mother and baby white rhino, just relaxing and chilling out under the shade of some trees; watched a trio of young lions lazing around on the grass near to the rangers hut whilst the sun was setting above them and almost looked as if the area was alight with flames. We stayed out into the dark of the night on another drive as our ranger became ever so excited as an alarm call came out from a thicket of trees whilst we were in search of leopard. As the sounds started to become more distressing, our ranger asked if we minded staying out a bit later to keep looking. It was pitch black with only the light of our rangers torch shining and darting up through the branches of the trees, completely quiet and still as the birds and animals lay silently hiding from the predator on the prowl, apart from the shrill calls of the grouse or turkey that we assumed was under threat. It was just so exciting. 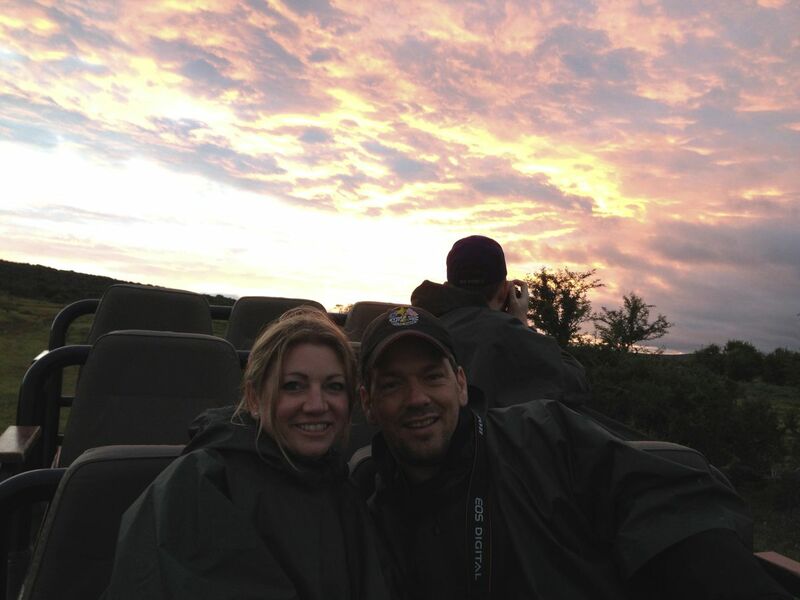 Mr B and I were sat on the back row of the jeep, and I was a little afraid of what might grab me from behind! Unfortunately we didn’t spot the leopard, so drove back to the lodge, but on the way we stopped, as a large pair of eyes glinted and shon back at the torchlight up ahead of us. No, not the leopard, instead it was a brown hyena which is rather endangered and very rare to see. On another occasion we were searching again for the elusive leopard, and came across a honey guide bird. Our ranger stopped the car and told us to watch as he got out, approached the bird and it flew off to another tree. but then he explained what the bird does. Basically it has a long standing relationship with man, in that it attracts the attention of a human by calling to them, then as the person walks towards them, it flies off to another tree, but in the direction of a bee’s nest. As you approach the bird again, it flies to the next tree and so on until you reach the nest, where the human is then said to share the honey with the bird. Although the truth is that as the human takes the honey, they leave behind the grubs and beeswax which the honey guide bird then feeds upon! How cute is that!! We pressed on though, along the path in search of the big cat, and were shocked to find that the bird was still following and calling to us all the way along the route! We all felt so sad for this little bird who was trying in vain to lead us somewhere, whilst instead we headed in the other direction. So, although it pretty much looks like a little sparrow – this is now my favourite bird! Another awesome moment was on a very early game drive again, where this time, instead of playing hide and seek with the animals, we turned a corner in our jeep (all wrapped up in our ponchos and blankets once again), and saw a mass of animals all grazing together in an open grassland area – different species of antelope, wildebeest, warthogs and long eared foxes, with glimpses of baboons, elephant, giraffe and rhino in the not too far distance ahead. It reminded me of the first Jurassic Park film, where they arrive and look out to the park with dinosaurs as far as the eye can see. It was truly beautiful. And the final surprise was to be met by this as we entered our room on the final night after our evening meal. Although as for romance on this little trip – I’ll admit there wasn’t much to report back on, as we were just too excited to be staying somewhere with the ability to catch up on sleep where we knew we wouldn’t be woken up at all hours by a screaming baby!! A laughing hyena perhaps, but not a baby!! So we had the most amazing time and would return tomorrow if we had the chance (and the money!!). 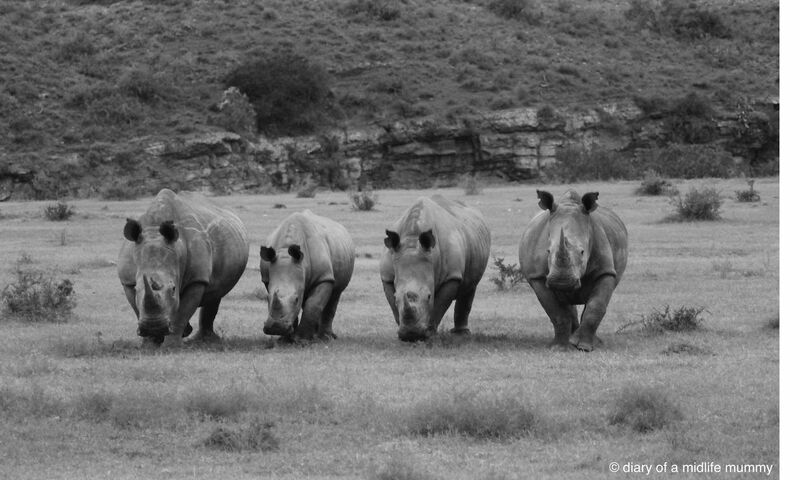 I definitely want to visit other reserves in Africa, where animals are seen in abundance, or in migration season perhaps, but Kwandwe will forever have a very special place in my heart. Then finally, to totally and utterly top our little four night getaway for two, we arrived back to Cape Town airport, walked through customs into the arrivals area only to be met by H, and as she spotted us in amongst our fellow passengers, she started running towards us crying ‘mummy’ and ‘daddy’ at the top of her little voice. It was a purely wonderful moment – just like that at the beginning and end of Love Actually (a particular favourite of mine). So ok, we had the most exhilarating and awe inspiring time in amongst the wild and the animals, but it felt just as wonderful and perfect to return to our babies and see how excited they were to see us. 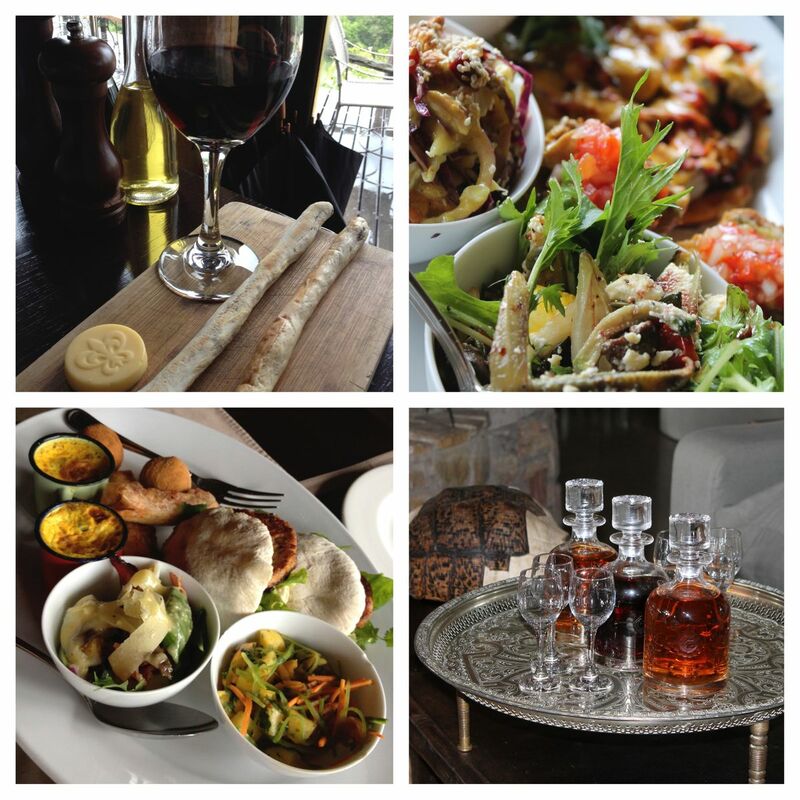 All ready for the last installment of our South Africa holiday……. Next Post Six months and still going…..